Liberty Ridge Farm, Upstate NY’s Original Fall Experience is right in the backyard of the Capital District. Celebrating many years of growing memories, you’re invited to join in the festivities! Nestled on the banks of the Hoosic River in Schaghticoke, NY, Liberty Ridge Farm’s 100 acres offers joy and fun for the whole family. Discoveries include an 11 acre cornfield maze, pumpkin picking, pig racing, cider donuts, shows, and over 20 hands-on activities with plenty of space to accommodate families, friends and groups of any size. Liberty Ridge Farm is a great place to hold school field trips, birthday parties, wedding receptions, sweet sixteen parties, Bar Mitzvah, team building and corporate events. Whether you are searching for a place to bring your family for the day, or looking to gather your church group, Scouts, or Clubs, Liberty Ridge Farm is the place to Unplug and Discover. Come spend an Autumn day on the Farm. 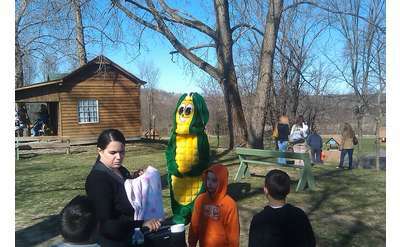 Check out the Pumpkin Patch, Cornfield Maze, Shows, and all the adventures at Liberty Ridge Farm’s Fall Festival. The Festival includes the Albany Capital Region’s largest and original cornfield maze, Brad’s Barnyard Adventure and lots of family fun on the farm in Schaghticoke, nestled in Rensselaer County, NY.